Tuesday, 3/10/15 - JH/S practices at Zion Beaver at 1pm. Wednesday, 3/11/15 - FMSM board meeting at Grace Dow Library (downstairs) at 6:30pm. Thursday, 3/12/15 - SUGAR plays at Bickford Assisted Living in Saginaw at 10:30am. 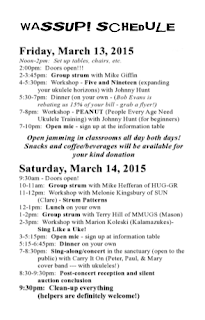 Friday, 3/13/15 - Second Jam at Midland Free Methodist Church, 5821 Eastman Rd. at 7pm is still ON! Friday, 3/13/15 and Saturday, 3/14/15 - WASSUP! 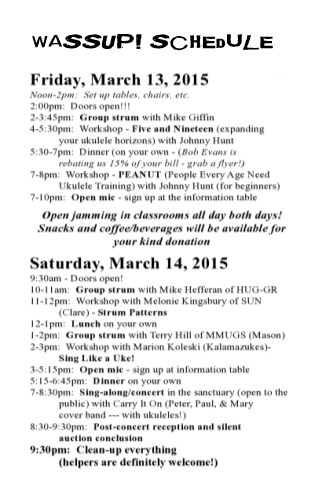 ukulele festival at MFMC Saturday, 3/14/15 - Traditional Dance - Midland Community Center at 7:30pm. "End of Winter" Concert: YAY!!! © 2013 by the Folk Music Society of Midland.